Women and Diversity in Insurance Trophies : Adina Grigoriu nominated for 2 awards ! Adina Grigoriu, CEO and co-founder of the Fintech and Insurtech Active Asset Allocation is very pleased to announce her nomination for two awards for the Seventh edition of the women and diversity in insurance trophy : Best Digital Woman and Best Female Leader. 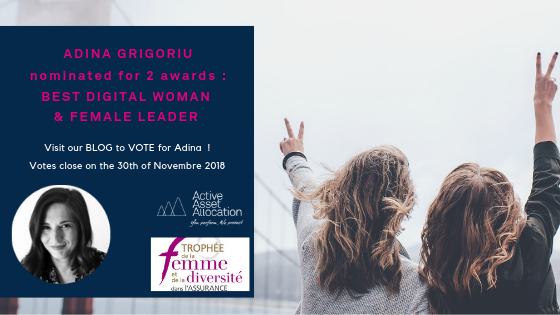 Adina Grigoriu, is nominated for Best Female Leader along side Corinne Cipière and Constance De Poncons. The three females leaders (Managing Director, CEO or Director), where chosen by the jury for their outstanding career paths, their energy and their ability to make the best choices to develop their companies, when facing adversity or growth challenges. With this trophy the jury will reward a visionary and passionate female leader and manager. Adina Grigoriu, is also nominated for Best Digital Woman along side Elisabeth Andrey and Claire Mayaux. The three nominees were selected by the jury for their pioneering spirit and outstanding momentum in implementing their digital marketing strategy, improving customer experience and successfully leading their company’s digital transformation. This trophy will reward an innovative and bold female entrepreneur who has made the right digital choices, bringing together management and execution teams in meeting employees expectations and answering the insureds’ needs. This edition, organised and hosted by l’Argus de l’Assurance will take place on the 11th of December 2018, in partnership with CNP Assurances, Hoya/Seiko and La Banque Postale, under the patronage of Marlène Schiappa, Secretary of State in charge of Gender Equality and combating discrimination. 9 trophies will be awarded (women citizen, commercial, digital, leader, expert, international, young talent, manager and risk manager), a tenth trophy will be awarded : the internet vote trophy ! The votes are open until the 30th of Novembre. The hashtag to follow the trophy on social media is : #ArgusTFA.